The most “hands-on” boiler and often regarded a life style choice due to the daily management requirements which will include manually filling the fuel chamber and occassionaly emptying the ash bin. 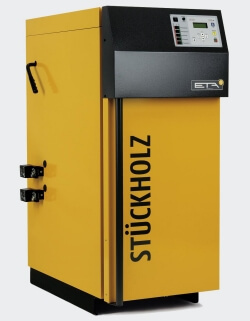 Many log boilers are sized for split logs of around half meter in length to simplify loading. It is important dry logs are used, having moisture content below 20% to maximise efficiency and reduce boiler maintenance. This necessitates logs are stored in appropriate conditions over a period of time, usually 12 to 18 months, to dry out from being virgin lumber. As heat from the log boiler is delivered in batches, it is necessary to store this in an accumulator tank, appropriately sized for the boiler and distribution system and slow release to the source of the heating demand. If you have access to a cheap source of lumber, space for its storage and a life-style that permits time to manage the fuel and boiler, a split-log boiler can be a cheap and efficient means of providing heat for your home, farm or business. Should the convenience of a fully automated heating system be sought but there is access to ready supply of logs a boiler such as the ETA SH-P TWIN combine a split log and pellet boiler provid a choice as to how to heat your property or permit you to go away and return to a warm house. The launch of the Domestic and Non-Domestic Renewable Heat Incentive schemes provide significant incentives for the installation of biomass boilers. As part of this scheme regulations are imposed on biomass boiler flue emissions. Fervo Renewable Energy only recommends boilers meeting these standards. In addition further requirements are to be imposed on the quality of fuel used once the installation is completed and this requirement will have implications for end-users wishing to self-supply wood fuel. There are many matters to consider in choosing a biomass heating system. Fervo Renewable Energy will be pleased to assist you in making the right choice for you and your property.